Fishing around Anna Maria Island is host to all spectrums of weather in March. Some days we experience hot, humid weather with no breeze to be found. Other days are more spring-like with warm sun and cool breezes. And other days are cold, dreary and windy. During these fluctuations in conditions, anglers need to adapt to the surroundings to be successful on the water. On the warmer clear sunny days, it’s wise to use live shiners as bait. Spotted seatrout, catch-and-release redfish and snook are on the feed in these warmer conditions and will readily eat a shiner. On the colder, windy days you might want to put the cast net away and go buy some live shrimp to use as bait. On these days, you might find yourself trying to stay out of the wind and trying to find warmer water. Fishing residential canals and docks is perfect for these windy cold days. Using shrimp in these areas will attract sheepshead, black drum and catch-and-release redfish. And, I wouldn’t be surprised if you hook a couple of catch-and-release snook, too. Having options available like this, is a great way to ensure that you can go out on the waters and produce a bite. You never know what March has in store for us here in Anna Maria Island, so always keep your options open. On my Southernaire charters, I’m doing just that — keeping my options open. With a string of beautiful days, I am fishing the flats for catch-and-release snook. Live shiners free-lined around mangrove shorelines, shallow flats and other staging points are producing some exceptional action on linesiders. 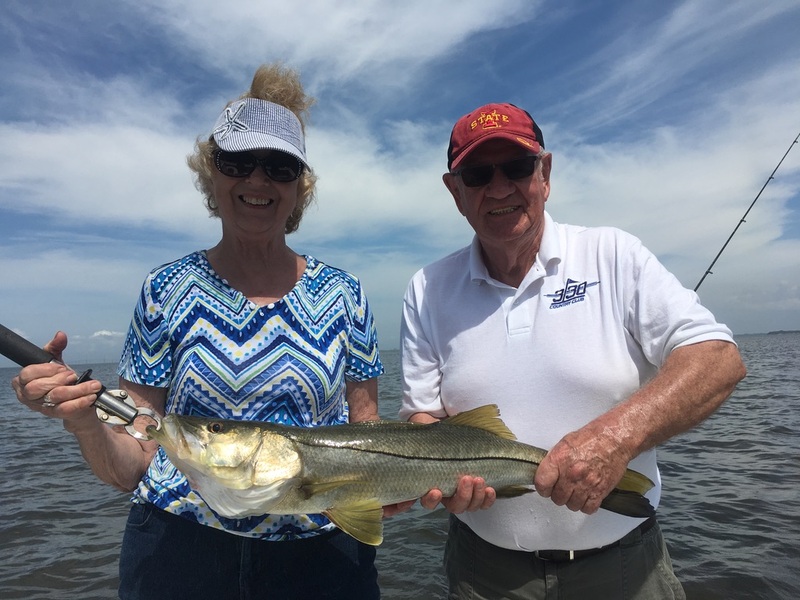 On days when it’s calm and sunny and water temps are in the mid 70s we are experiencing some of the best catch-and-release snook fishing of the year. Spotted seatrout are also very receptive in these conditions. Over deep grass areas I’m finding quite a few slot-size fish as well as some gator trout. On the not so favorable weather days, I’m switching tactics by using live shrimp as bait. Changing my location is also playing a factor. On days around the cold fronts, water temperatures drop dramatically which, in turn, affects the catch-and-release snook in a negative way. In layman’s terms, “when it’s too cold, they aint gonna bite.” So on these days, I’m moving to calmer waters such as canals and other sheltered areas out of the wind. These areas are host to sheepshead, black drum and catch-and-release redfish. All three of these species love to eat shrimp so that’s what I’m offering. So, no matter what the condition there are always fish to be caught. I guess you have to have a line in the water to find out. On a final note, snook are redfish are still closed throughout our region. The Florida Fish and Wildlife Conservation Commission is supposed to hold a meeting in May to reassess this closure, but as of right now, both species are catch-and-release only. Also, spotted seatrout can only be kept in the slot of 15-20 inches — no oversize fish.